This is a demo application and it could be a good starting point of a full-featured reservation app. All the described features can be extended, new powerful abilities can be added. Lightweight component with intuitive interface. You can create neat and fast web calendars with drag-and-drop support. dhtmlxScheduler is cross-browser and cross-platform UI component, so it works well on all major browsers and different devices. Simple integration with any server-side technology. 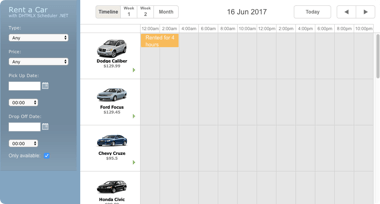 You can create php reservation calendar using your favourite PHP framework and REST API. 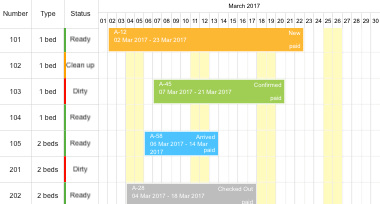 This js scheduler calendar provides accessibility features such as high-contrast skins, WAI-ARIA support and keyboard navigation. The Scheduler demo files in the package are covered by the terms of evaluation license. You can use them for evaluation purposes for free for 30 days. To use dhtmlxScheduler in your proprietary project, you need to obtain Commercial or Enterprise license. 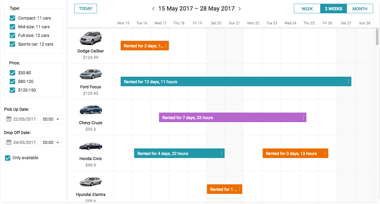 See how dhtmlxScheduler.NET is used in rental management application. The demo is implemented in ASP.NET MVC5 Razor.